On Wednesday 7 March 2018, Tsekho Tukchak, a Tibetan from Ngaba County in Sichuan, set himself on fire in a protest against the Chinese government’s continued repression of Tibetans. Mr Tukchak was known throughout his region for speaking out on Tibetan issues and had raised concerns over the increasing Chinese police presence in the area and the repression of Tibetan people and culture. His protest was planned to take place on 10 March, which is the anniversary of the 1959 failed uprising of Tibetans against the Chinese occupation. This uprising saw thousands of Tibetans killed and led to the Dalai Lama’s flight to exile. This day is also the 10th anniversary of the beginning of a week-long peaceful protest by Tibetans, which again was met with police brutality and ended in the violent riots in the capital of Lhasa. Sadly, Mr Tukchak died as a result of this protest. He is now the 153rd Tibetan, since 2009, to use self-immolation to protest against the oppressive policies that Tibetans suffer and to call for the freedom of Tibet and the return of the Dalai Lama from India. A Tibetan man self-immolated on Wednesday [7 March 2018] in Sichuan’s Ngaba county in an apparent protest against Chinese rule and policies in the far-western region of China, a Tibetan source living abroad said. Tsekho Tukchak, set himself ablaze in Ngaba’s Meruma township at about 5 p.m local time and died at the scene, said Meuruma Kungyam, a Tibetan political prisoner living in Australia who is from the same town as Tukchak. Tukchak, also known as Tsekho Topchag, was in his early 40s and is survived by his mother, wife and two daughters, he said. Local residents told Kungyam that Tukchak had lately expressed concern about China’s occupation of Tibet and repression of the Tibetan people and their culture. In recent days, Chinese authorities have deployed an increased number of security forces in Meruma, ready to crack down on large gatherings and blocking internet service, he said. Tukchak likely self-immolated on Wednesday because he assumed the heavy security presence would have made it difficult to carry out his plan on March 10, Kungyam said, referring to the 59th anniversary of the failed Tibetan uprising against Chinese occupation of the formerly self-governing region. Security forces are spreading throughout the region in the run-up to the anniversary of the incident, which saw thousands of Tibetans killed amid a crackdown by Chinese authorities and led to the Dalai Lama’s flight into exile in 1959. The day will also mark the 10th anniversary of the beginning of several days of peaceful protest that were brutally suppressed by police and culminated in an anti-China riot in Tibet’s capital Lhasa on March 14, 2008. During the riot, Tibetan demonstrators torched ethnic Han Chinese shops in the city and carried out deadly attacks on Han residents. 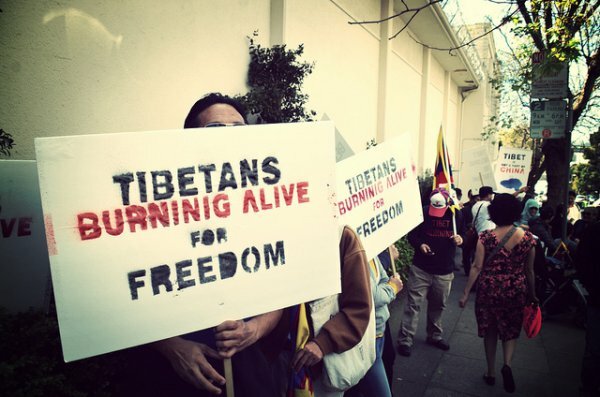 Protests then spread across Tibet and into Tibetan-populated provinces of western China, causing official embarrassment ahead of the August 2008 Beijing Olympics. Hundreds of Tibetans were detained, beaten, or shot as Chinese security forces quelled the protests. Chinese officials later said that 22 people, mostly Han Chinese and Hui Muslim civilians, had died in the Lhasa rioting, but denied that police had fired on protesters. Meanwhile, news of Tukchak’s death has spread throughout Meruma township and beyond. “Tibetans in Tibet are sad to hear the news and are mourning the death of the self-immolator Tsekho,” a source inside Tibet, who declined to be named, told RFA. Tukchak’s self-immolation was also noted by Lobsang Sangay, president of the India-based Central Tibetan Authority (CTA), who expressed “deep concern” over the incident and reiterated an appeal by the CTA to Tibetans to refrain from such protests in a statement on Wednesday. Tukchak’s protest brings to 153 the number of self-immolations by Tibetans living in China since the wave of fiery protests began in 2009.